Buying designer sarees online shouldn’t be much of a challenge as most Indian designers sell their creations online. However a working knowledge of Indian designers and their area of specialization are important while shopping online for designer sarees. It’s fair to say that almost all Indian designers have their fair share of brilliant collections when it comes to ethnic wear but when it comes to sarees, few designers have truly created a name for themselves that sets them apart from the rest. While shopping for sarees online, it’s important to know these designers and understand if their design sensibilities match yours to be inspired enough to hunt for their creations online, which is why we have put together a list of top ten designers that are sure to make your online shopping experience a pleasure. Read further to understand these creative minds and their influence and fall in love with the timeless saree all over again. Manish Malhotra’s signature style is an abundance of vibrant shades and a lot of bling. If you are shopping for festive wear sarees online that are apt for social events and festive gatherings with a youthful vibrant vibe, then Manish Malhotra sarees are worth your money. 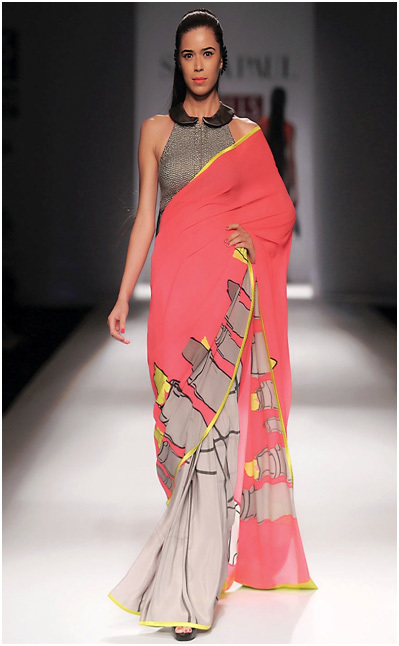 Satya Paul’s area of specialization is definitely light fabric, printed sarees with a wide range of creative prints. The ensemble is often accentuated with a dramatic, unique fabric or unique design blouse. Satya Paul sarees are just perfect for high fashion soirees, luncheons with friends and even work wear. Sabyasachi Mukherjee sarees are definitely a class apart mostly due to the antique exquisite appeal his creations are known for. Sabyasachi Mukherjee is known for his extensive use of traditional embroidery and crafts hence each saree is a work of ethnic art. A JJ Valaya saree is characterized by its opulence and royal themes. JJ Valaya’s saree collections are influenced by global trends and design sensibilities, take for example his 2012 Azrak collection which was based on a Turkish Ottoman Empire theme. It is worth your time checking out JJ Valaya collections while saree shopping online. Ritu Kumar is definitely the uncrowned queen mother of the Indian fashion Industry and one of the stalwarts and pioneers in her field in the country. Ritu Kumar has made a name for herself over the years and is responsible for some of the most memorable ethnic wear collections. Ritu Kumar sarees are a truly traditional experience; her creations extensively involve indigenous fabrics and crafts such as zari, resham and zardosi. Silver and gold thread embroidery is a replaying theme with Ritu Kumar collections. If you are looking for an ultra-modern ensemble and silhouette that flatters the female form; then Ritu Beri sarees are just the right kind for you. 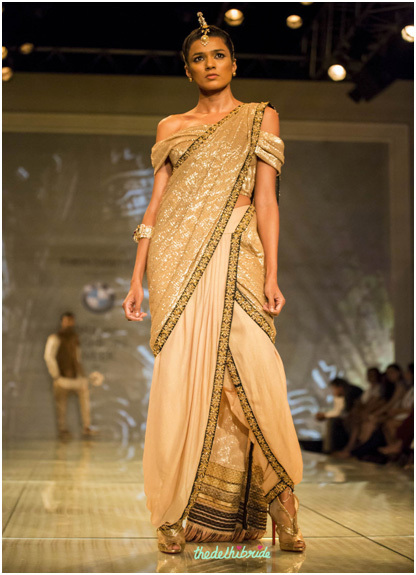 Ritu Beri sarees are all about glamour and minimalism, perfect for party wear and social soirees. Tarun Tahiliani is hard to beat when it comes to bridal wear and a Tarun Tahiliani bridal saree is for sure one of the best in the country at any point of time. This brilliant mind has made a name for him self in the field of ethnic wear for women and his bridal sarees are every prospective brides dream. Rohit Bal’s design sensibilities can be summarized in to three words that really hit the target; inventive, innovative and contemporary. 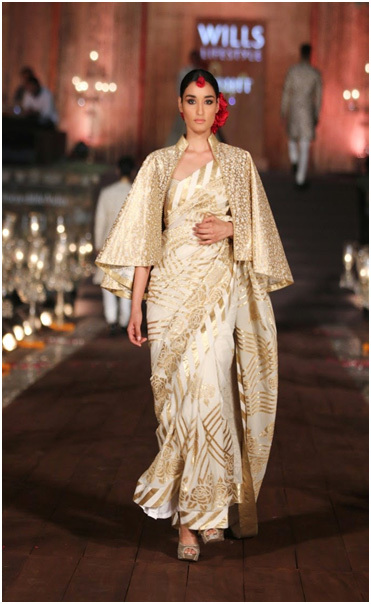 Rohit Bal has taken the Indian saree with its traditional elements in intact and given it a fresh lease of life by constantly incorporating contemporary fashion elements. Take for example the this cape saree; Mr. Bal has incorporate the currently trending cape in to an otherwise traditional embroidered saree to appeal to a contemporary buyer who is perhaps more inclined towards western forms and silhouettes. When you are looking for youthful vibrancy with a heady dose of grandeur, than Rohit Verma is the go to guy. Rohit Verma is known for his youthful design sensibilities and his ability to create couture sarees that are sleek and minimalistic and adequately flatter the female form. Sheer net fabrics, exquisite indigenous embroidery techniques and ultra feminine design sensibilities are the hallmarks of a Shane and Falguni Peacock Saree. 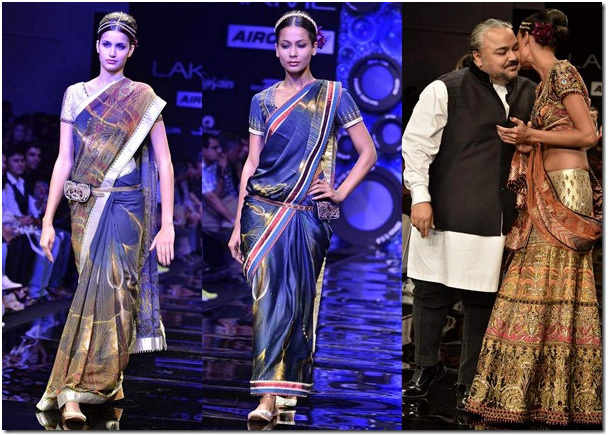 The saree in the picture above is a great example of this designer duo’s design sensibilities. Shane and Falguni Peacock sarees definitely cater to the young contemporary buyer.